Phyto Phytolisse Finishing Serum – Hall of Fame Worthy? Speaking of sprays, how about two made just for strands? L’OREAL EverPure UV Protecting Spray ($8.99/8.5oz @ amazon.com). If you color your hair and you’re hitting the beach this summer, this is a must-have product! It’s sulfate-free (duh, would hope it would be) and contains UV filters to keep the sun from changing your hair color. This product contains Methyl Parabens, which is considered by some as an ingredient of concern. Read more here. Read my ingredient disclaimer here. PHYTO Phytomist ($26/5oz @ nordstrom.com) – made just for dehydrated hair, which can happen from coloring or perming (perming?? Like pantyhose, will the perm ever come back into fashion?! ), this uses botanicals to help prevent oxidation. FYI, it has silicones in it. Disclosure: One of these items was provided to Cybelesays.com for review purposes. One I bought. This time of year brings out the best when it comes to products. As in, gift sets!! They are always a great value and I’ve seen some really good ones. Since we're in the home stretch, here are three I’ll be giving. PHYTO Coveted Collection ($60 @ nordstrom.com) contains 1.7oz sizes of the following: Phytovolume Actif, Phyto 7 Daily Hydrating Botanical Cream, Phytodefrisant Botanical Hair Relaxing Balm, Phytomist Instant Hydrating Conditioner, and Phytolisse Shine Serum. MOLTON BROWN Atlantic Trail Gift Set ($55 @ barneys.com) – contains 3.3oz sizes of Heavenly Gingerlily Moisture Bath & Shower, Warming Eucalyptus Bath & Shower Therapy, Invigorating Suma Ginseng Bath & Shower, Energising Seamoss Bath & Shower, Inspiring Wild-Indigo Bath & Shower, Ultrasmooth Coco de Mer Lotion. PACIFICA Hawaiian Ruby Guava Spray Perfume Set ($20 @ pacificabeauty.com) is comprised of Spray Perfume (1oz), Soy Candle (3oz) and a wicked cute pack of matches. Let’s help PHYTO celebrate 40 years of good hair products! Wow, I can’t believe they’ve been around this long. So go out and get yerself their Phyto 7 Gold ($29/1.7oz @ dermstore.com) to help celebrate. It’s a hydrating apply-to-towel-dry-hair, leave-in cream and contains a lot of green ingredients: sage, burdock, calendula, rosemary, soy and mallow, to name a few. This is a great one at conquering frizzies and static, which is a common fall-out from these kinds of temps. Happy Anniversary Phyto! PHYTO just came out with their latest botanical duo, Phytodensium. I never thought about this but as we age, the hair on our head decreases in density and can loses its depth of color and shine. Huh? All we hear about is how our skin ages! How often do we think about our hair aging? I guess I need to add this to my list of things to worry about, as I get older. But maybe not that I have these next two in hand. 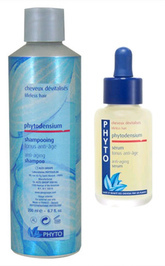 Phytodensium Shampoo ($22/6.7oz) and Phytodensium Anti-Aging Serum ($24/1.7oz) both use key age-defying ingredients. Wanna know what they are? Me either. All I know is that I have always trusted the Phyto line to really take care of my strands. Both @ dermstore.com.